James McMahon was born in 1869 at South Creek, near St Mary’s, son of Irish migrant James McMahon (d.1914) and Mary, née Coyle (d.1924). He died on 1 January 1951, aged 82, and was buried in the family grave in the Catholic section of Rookwood Cemetery. James McMahon lived most of his life in Redfern and was well known as a champion footballer. He played with Rosedale Juniors before joining Randwick club and playing against New Zealand and English teams in Sydney in 1888 and against England again in 1899. He was manager of the 1908 Wallabies tour of England. His father ‘Butty’ McMahon built up a successful business as a carrier, starting with a horse and dray, investing in real estate, and eventually monopolising wool cartage from Central Railway to the Circular Quay wool stores. His son James and his brothers inherited their father’s lucrative carrying business as well as several Sydney and country properties. James McMahon junior was also President of the N.R.M.A. 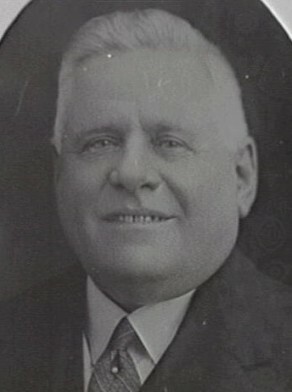 James McMahon was Alderman for Gipps Ward, 18 June 1930 to 1 December 1950. He was a member of the Finance Committee, 1930-35, the Health and By-Laws Committee, 1930-38, the Health and Recreations Committee, 1938-50, the City Planning and Improvements Committee, 1938-39, the Electricity Committee, 1938-41, the Works Committee, 1932-50 and its Vice-Chairman from 1932 to 1944. He was also a member of the Special Committee on National Emergency Services, 1940-46.